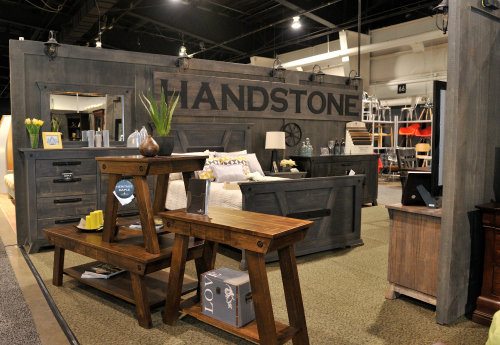 The 44th annual edition of the Canadian Furniture Show (CFS) hit Toronto’s International Centre during one of balmiest weekends Ontario has seen so far, welcoming well over 200 exhibitors and treating attendees to some high-profile celebrity appearances. Always a work in progress, the show set itself apart from last year’s event by slicing its runtime to a more compact three-day schedule (running from May 28 to 30) and doing away with the controversial – and much maligned, in some circles – Consumer Day. This country’s only national furniture industry trade event generated a little buzz by welcoming acclaimed Canadian designer and television personality Steven Sabados to the Hall 5 stage to talk about the latest trends in home décor. The talk notably marked Sabados’ first public appearance since the tragic death of his business and romantic partner, Chris Hyndman, shortly after last year’s market. In 2015, Sabados and Hyndman – who designed pieces for the popular S&C brand and starred in the popular CBC-TV design show Steven & Chris — spoke at the show’s inaugural (and last) Consumer Day about what was hot (and what was not) in the furniture and décor world. About two months after last year’s June show, people were shocked to discover that Hyndman, one part of the bubbly and gregarious design duo, had been found without vital signs in a laneway near the Toronto home he shared with Sabados. After almost a year of silence, Sabados returned to public life to chat with the CBC about his partner’s untimely passing and some upcoming design projects and to appear at the market to give a attendees a little light-hearted lesson on what’s trending. Surprisingly, grey is not. Or at least it’s cooling down. That said Grant and Sabados were careful not to advise against producing or retailing the once wildly popular neutral. What’s also out? All white interiors, simply because they’re not practical for anyone with children, pets or a habit of spilling red wine. As for what’s in, Sabados and Grant sang the praises of neutral pastels that aren’t overly sweet, bold glamor (pieces that evoke images of Marrakesh and spices and high fashion), organic primaries (shades of nature, such as brown, green and blue) and hot black (statement pieces that give rooms a remarkably sophisticated and bold pop). Click here to read Ashley’s complete report on the 2016 edition of the Canadian Furniture Show.